Well yes you read that right! The CDMA based Verizon iPhone 4 has been successfully unlocked to work on pay-as-you-go Cricket Wireless network. Previously, a Chinese carrier named China Telecom managed to unlock the CDMA based Verizon iPhone to run on their CDMA network. Can I flash a phone to work on the Cricket network? Yes, Cricket will activate any phone that’s been flashed to work on the Cricket network. 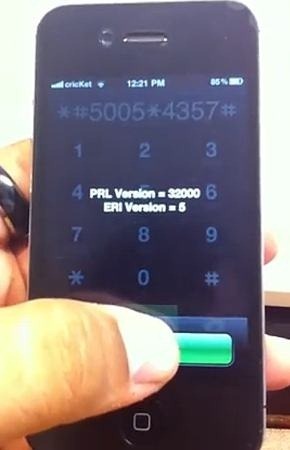 Cricket corporate stores currently do not flash phones to work on the Cricket network but many of the indirect dealer (both standard and premier) have the ability to flash a customer’s phone, and most corporate stores will be able to tell a customer where to go to have their phones flashed to Cricket. If you choose to activate a non-Cricket phone on the Cricket network, there is a possibility that some of the phone features or service plan features may not operate. Additionally, flashed phones are not eligible for the Cricket Phone Replacement Program or Cricket Warranty Exchange Program. Not all phones are capable of being flashed to work on the Cricket network. We have already reported about Verizon’s iPhone being a world phone, with both dual mode GSM and CDMA chips. Now it will be interesting to see if the iPhone Dev-Team will take the challenge of creating a public unlocking solution for the CDMA-based iPhone 4 on Verizon so that we can make it work on other CDMA networks like Sprint in US. If any people guys has trouble սոⅼοсking AT&T phones, because you need to know any good 3rd party ՍΝᏞΟᏟΚing method, you can take having a look at just google atttiphoneeuunloockiing, it’s the most trustworthy սոⅼοсking site I have ever use, we can սոⅼοсking the newest 6S and 6C as well.